hile for years the quality of Spanish wine in the more established regions and DOs had been acceptable it could also have fairly been said that the real potential in the country remained untapped. However, the past half decade or so has seen dramatic change both in fine-wine production and in lesser regions. There are new-wave Riojas and an abundance of great reds from Castilla y León, but other, smaller regions like Priorat have also been providing some remarkable and striking wines in recent years. Further south, in the great centre of the country, relaxation of the regulations governing irrigation and a desire to harness the potential of the best hillside sites as well as some fine, old bush-vine plantings of regional varieties has brought increasing change. It remains depressing, however that despite all this there is still a sizeable amount of sometimes very mediocre wine being produced in almost all the established regions. The wines of north-western Spain are produced in Castilla y León and Galicia. Immediately to the west of Rioja is Ribera del Duero which, along with exceptional examples in Rioja and Priorat, produces most of the finest reds in the country. The historic Vega Sicilia bodega is based here and top reds are produced in and around the region as Vinos de Mesa and Vinos de la Tierra (VdT) as well as DO. While the greatest Ribera del Duero wines are both magnificent and pricey, too many remain depressingly mediocre with baked and often dried out fruit and hard tannins. The wines are based on Tinto Fino (Tempranillo) but may also include Cabernet Sauvignon, Merlot and Malbec in the blend. To the north-west is the small DO of Cigales, where some good, structured reds are made, and to the west the white-wine DO of Rueda. Interesting barrel-fermented and single vineyard wines from both Sauvignon Blanc and the local Verdejo are produced. The latter can be responsible for some very striking and potentially ageworthy whites. Immediately west of Rueda and also centred on the Duero river towards Zamora and Portugal is the warm red-wine area of Toro. The vineyard area here has always promised much but it is only relatively recently that wines of real depth have begun to emerge, some world-class. A local strain of Tempranillo, Tinto de Toro, is the mainstay of blends but Garnacha is also permitted and old vines contribute much to quality. A number of very impressive wines are also produced under the VdT (Vinos de La Tierra) Castilla y León classification. 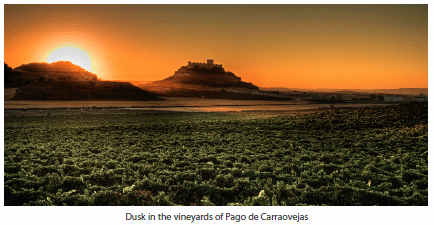 Look out also for the recently established DOs of Arribes and Tierra del Vino de Zamora. In the far west of the Castilla y León region is the small, visually striking DO of Bierzo which now produces both easy-drinking and truly exciting reds as well as a little white. On a note about classification VdT labelled wines are gradually being moved to the new IGP (Indicación de Origen Protegida) like France. Wines labelled VC (Vinos de Calidad) are from regions due to be upgraded to full DO status. In the south of Castilla y León is the newly established Sierra de Salamanca DO producing stylish reds from the indigenous Rufete. Virtually adjoining Bierzo but in fact in Galicia is Valdeorras. Reds are produced, like those in Bierzo, from Mencía but of particular note are the whites produced mainly from the unusual, indigenous Godello. The best are floral, ripe and respond well to handling in oak. Some attractive, fruity as well as more structured whites are also produced in Ribeiro but the greatest concentration of bodegas are found in the coastal vineyards of Rías Baixas. Their strikingly aromatic whites are generally best enjoyed young but the odd example is successfully barrel-fermented and will keep in the short to medium term, not dissimilar in this respect to more structured examples from Condrieu in the northern Rhône. Some exceptional mineral, elegant and nervy reds also emanate from the, at times near vertiginous, slopes of Ribeira Sacra. Fine reds and whites are also found at Monterrei on the Spanish/Portuguese border.